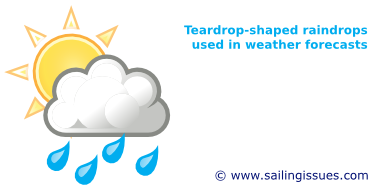 When forecasting rain - however rare in Greece or Turkey - it is important to realise that most people get taught that rain drops are shaped like tears by (university!) teachers that are actively perpetuating this urban myth. Weather icons used throughout the media are illustrative of this widespread fallacy, just do a google image search. Also note that a spherical raindrop is a prerequisite for rainbows to occur. With teardrop shaped rain we would be deprived of this colourful phenomenon. 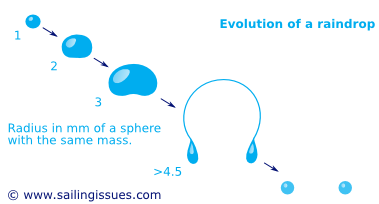 Although the predominant shape of a raindrop is spherical there is actually an evolution in morphology while the drop grows by gathering tiny drops and accelerates downwards. First the headwind will flatten the underside and subsequently bisect the rotund drop. The collapse of the bridge (and subsequent loss of water) yields two new small and perfectly round drops, and the whole process starts all over again for each new one.